Flying circles in an endless holding pattern with your current digitization workflow? docWorks offers a virtual cockpit and command center for managing production workflow and system environment of digitization projects. A comprehensive solution that easily navigates through large or multiple digitization projects; Streamlined Multiproject Management and Statistical Analysis removes unexpected take-off delays & in-flight turbulence and gets you to where you want to go as smoothly and efficiently as possible. A beneficial suite for project managers, team leaders and IT administrators. Ascend into a virtual jetstream of productivity! Take command of where you are and where you want to go and soar to great new heights with docWorks Control Center (Basic, Enterprise or Pro)! 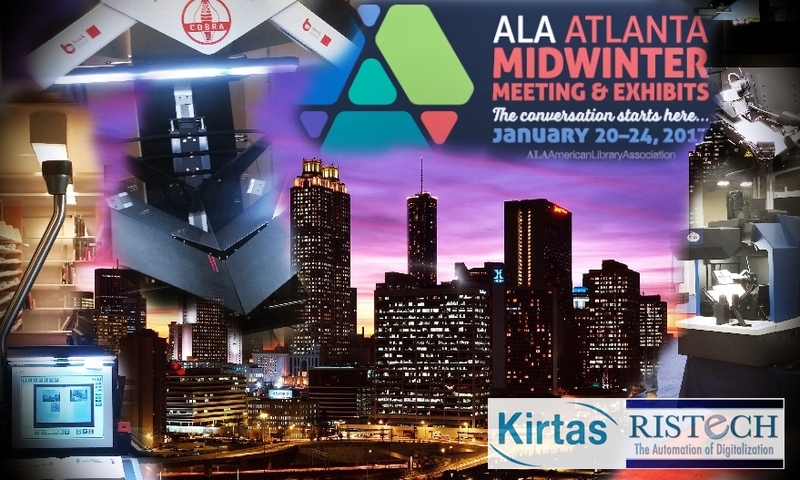 Contact Kirtas, Inc. or Ristech Co. today! 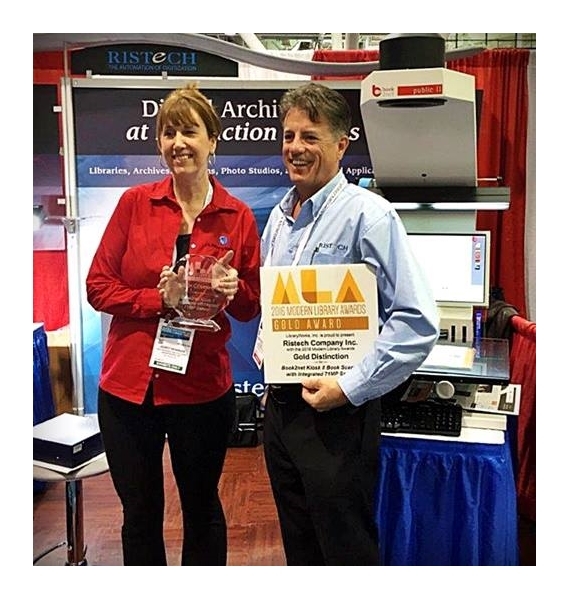 Kirtas' parent company, Ristech Co. has been presented the Modern Library Award for Gold distinction for the Book2net Kiosk II Book Scanner with Integrated 71MP at the 2016 ALA Midwinter Meeting in Boston, Massachusetts. 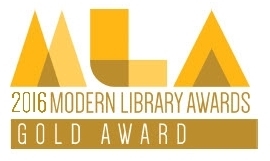 The award was based on judging by librarians who use the Kiosk. This year's program featured over 50 products submitted by 42 companies. Judges were asked a series of questions regarding the quality, functionality, value, customer service experience, and overall satisfaction with the Kiosk. Votes were tallied and averages calculated with great results! Digitizing analog documents, books and works of art has developed into a broad-based professional activity with the aim of saving and preserving our cultural heritage and making it accessible to research and reference for generations to come. The proliferation of digital image processing and enhancement techniques along with the development of high-resolution and color-stabilized cameras, the proper storage and distribution media has brought professional digitization systems into the mainstream of technology evolution, not as present as entertainment media but an equally important technology. Almost every library and document repository in the developed world today has a well-funded department charged with the ongoing effort of digitizing their holdings. This is, no doubt, a costly and tedious task, since every book has to be scanned page by page by specialists who know how to handle sometimes unique, irreplaceable and fragile items with due respect to their status. Equally demanding are the requirements placed on the design of the equipment used in this process to prevent damage to the items scanned. High-resolution cameras specifically designed as book scanners are a precondition for these delicate tasks. Equally important are professional organizations and industry groups such as “book2net” – an international alliance of solution providers and users – developing the appropriate scanning systems and procedures for archives, libraries and museums around the world. An additional objective is the continuous upgrade of these scanning systems to meet the increasing user demands. Microbox GmbH, a highly specialized systems developer and service provider in this field, headquartered in Bad Nauheim, Germany, is marketing a broad range of book2net book and document scanners. Their systems are equipped with sophisticated LED illumination systems and are offered in several configurations from manual entry-level to fully automated workflow optimization. Additionally they feature OCR character recognition and support a wide range of standard, single- and multi-page file formats. An online document and book presentation software, called “Virtual Reading Room” enables an authentic reading experience of the scanned materials. 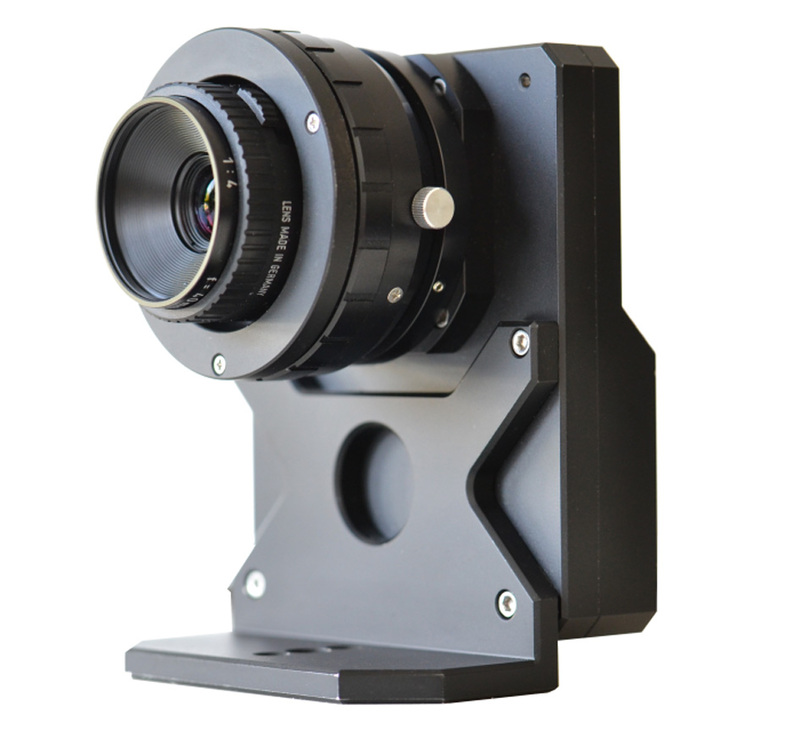 About two years ago, in the context of expanding its offering of book scanners, Microbox became aware of the new extremely high-resolution CMOS image sensor developed by CMOSIS, a pure-play supplier of standard and application-specific CMOS image sensors for industrial and professional markets such as machine vision, scientific, medical, automatic data capture and space, headquartered in Antwerp, Belgium. Their low-noise area-array sensor CHR70M realizes an up to now unprecedented image resolution of 71 Megapixels on a 36 x 24 mm² CMOS chip, laid out in a square pixel pitch of 3.1µm. The CHR70M sensor provides an extremely large image area of 10,000 by 7,096 active square pixels in a standard Bayer color layout but is also available as a grey-scale system with even higher resolution. Let Kirtas' Digital Service Bureau Handle Your Digitization Needs! 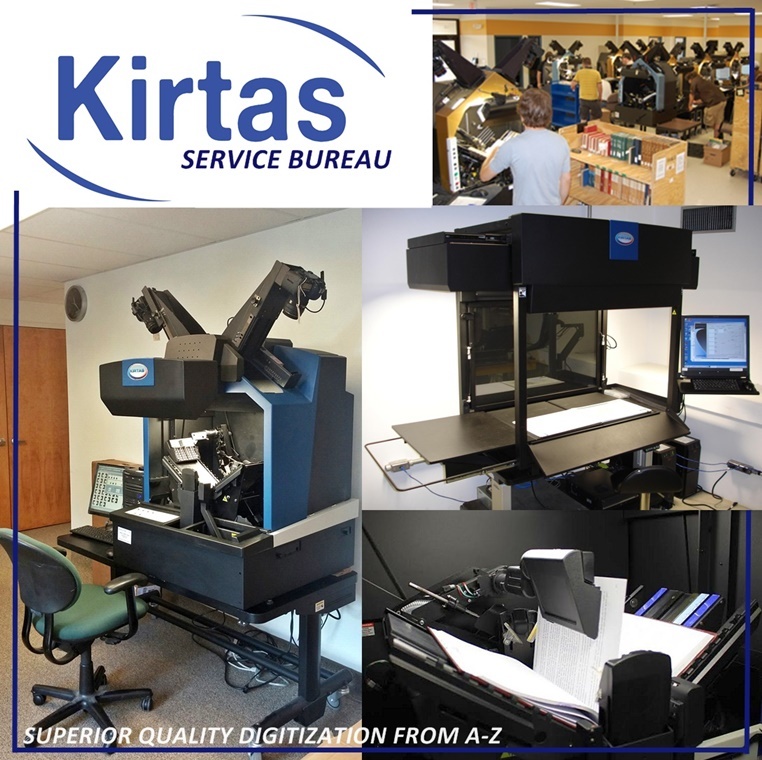 With nearly 15 years of experience as a designer, manufacturer and provider of automated bound document digitization solutions, Kirtas also provides digitization services through its Service Bureau, located at its headquarters in the picturesque Finger Lakes region south of Rochester, New York. Our service bureau strives to provide color accurate, high resolution, archival quality digital images from a wide range of original source material. Our past clients have included Microsoft Live Search, Yale University, Amazon, University of Michigan, Cornell University, Classmates, Ancestry.com, the New York Public Library as well as dozens of other respected universities and companies both domestic and abroad. In order to achieve complete customer satisfaction, we employ top of the line digitization solutions-- from our own award-winning line of KABIS bound document scanners to our European partners' lines of high resolution, digital capture solutions. We also have co-developed our own cutting edge image processing technologies for optimizing output, offering features such as curvature correction, light uniformity correction, image segmentation, background removal, optical character recognition (OCR), and embedded structural, descriptive and technical metadata to deliver versatile, superior quality digital content. We guarantee proper and gentle handling of source material in the creation of high quality derivative output files. For over ten years we have been pleased and proud to offer a 100 percent quality review of all digitized output before it is sent out of our facility and back to your doorstep. Preliminary consultation with our team of experts ensures that you will receive exactly what you want at a competitive price with the superior image quality that you deserve. Even if you don't know what you want, we are more than happy to discuss your project upfront and make recommendations based on our substantial experience with our eclectic assortment of past and present clientele. Like the letters in a book, Kirtas covers digitization from A-Z. Contact us at and let us assist you in your important digitization initiatives now and in the future! Ristech is excited to announce that we are now offering the LuraTech PDF Compressor software technology that can benefit your operation of providing Cultural Heritage content easily via the internet to your patrons. The PDF Compressor is the professional solution for high quality, process-oriented conversion and compression. It is flexible, scalable, and designed for processing very large files to a manageable size for network delivery. This solution can be configured for any size project you have! The software’s outstanding compression reduces large files significantly and delivers outstanding image quality in one of several PDF/A formats that are ISO-compliant designed for long-term archiving. The LuraTech PDF Compressor turns all your image and data files – whether scanned or born digital – into a single unifying file format. The award-winning mixed raster content (MRC) layer-based compression technology processes high-resolution black-and-white, grayscale, and color images or scanned documents, with compression ratios of 100:1 or better. Outstanding image quality and crisp text legibility are preserved, while storage costs and bandwidth requirements for transfer are drastically reduced. This industry solution can be used for projects of all sizes and can be purchased as a license for recurring use or one-project use starting at 12,000 pages a year to hundreds of millions pages a month. The PDF Compressor is used in many industries, including scanning services, libraries, government agencies, cultural heritage and archives.